Dubai is a dynamic, fast-moving and eventful city. Visitors come to experience a world-class tourist and business destination, and many of them arrive to attend meetings or other types of business events. The events industry is one of the foundation stones of the UAE’s bustling and increasingly diversified economy. 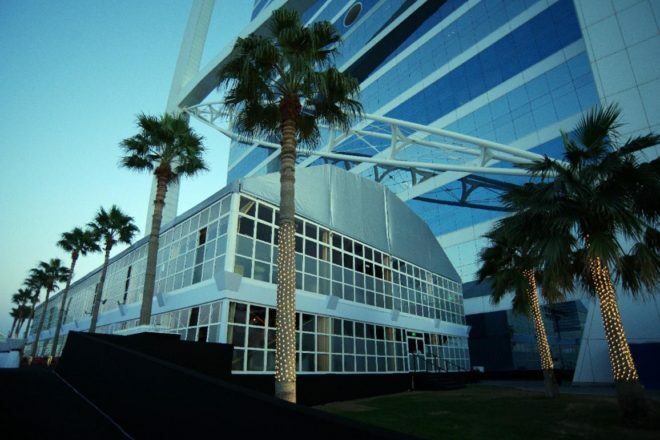 Dubai, or the UAE generally, is one of the most popular locations globally for organising and hosting high-profile events. 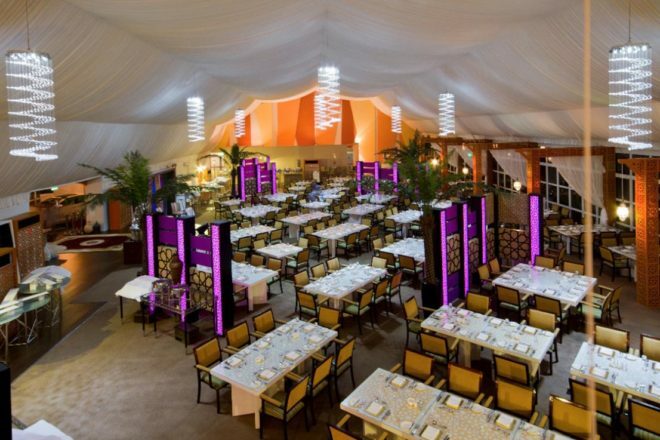 Event planners in Dubai are some of the busiest and most creative people around. They understand that the starting point that can make or break any event is the venue. The country boasts of different types of purpose-built venues in all shapes and sizes. But what can you do when no existing place meets all your technical or aesthetic requirements? Create your own space! Temporary structures should be your go-to solution because they are so flexible, versatile and adaptable. They are an ideal resource when you need to up the innovation quotient and increase the wow factor. 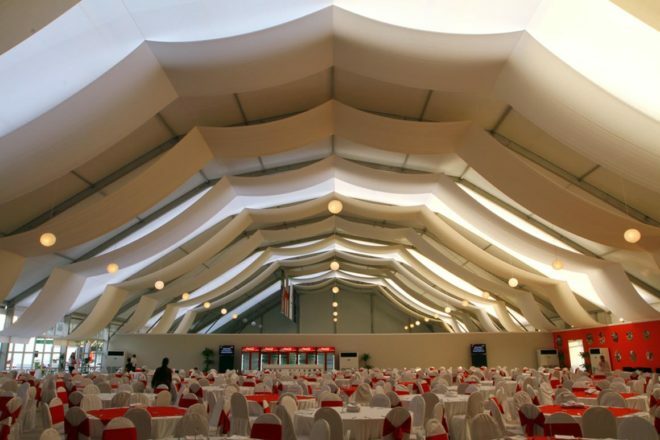 Temporary structures should not be considered as a lesser alternative to traditional banquet rooms, conference rooms or exhibition halls, but as an attractive option for manipulating and creating new kinds of space. They can be used to expand seating flexibly or to carve up large areas into special zones in non-traditional ways. Temporary structures can be used alone or in conjunction with permanent venues, for example, to create specially designed entryways, or to set up separate display or work areas. 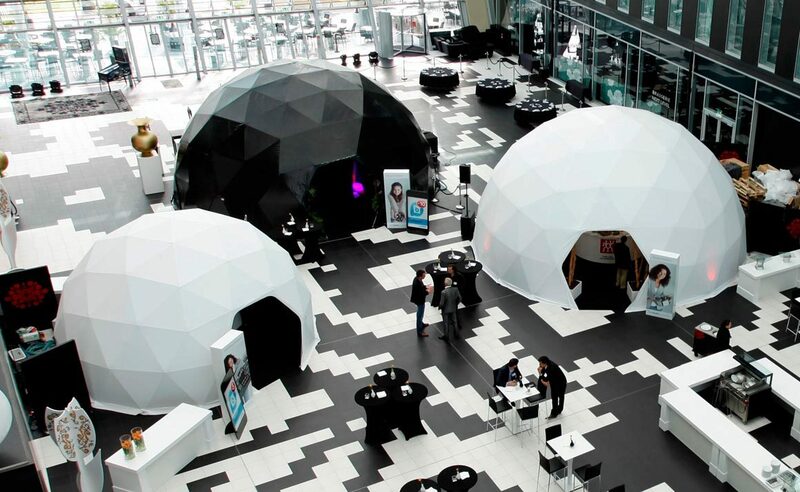 If you think about the most common challenges event planners are facing such as time and space management, budgets, creating outstanding customer experiences, and so on, all these can be helped by using temporary structures. Modular, and flexible, temporary structures can be set up quickly and in virtually any location. You can use them outdoors or indoors, as separate stand-alone installations, or as part of a group of interconnected structures. Essential & Complementary Services: Aside from the actual installation or construction, there are many things a good supplier should be able to provide which include flooring, staging, lighting, ventilation, décor, accessories. Marquee or tent, there’s a lot to do to make an event happen, from flooring and staging to lighting and ventilation and more. This is about the type of space needed. Temporary structures can help manipulate space, creating new areas for your customers or guests to feel special, engaged, entranced; creating a stage, setting the launch of a product or service, or the platform for the exchange of ideas. Temporary structures can extend seating or carve out meeting areas. Once you’ve identified the type of space you require, then you can start choosing which temporary structure best suits your event. This includes time frames for setting up of the structure and decoration. 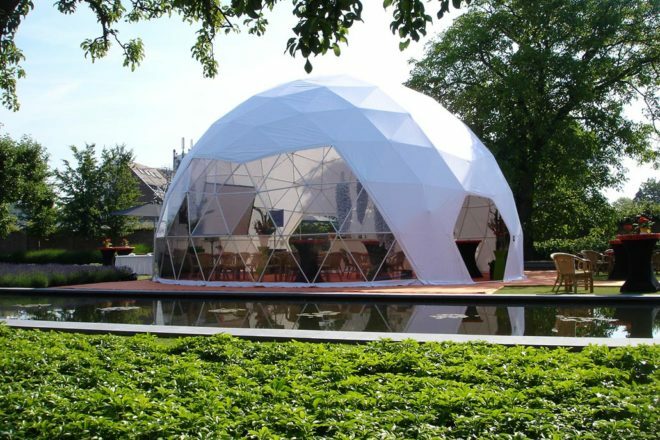 Dome tents for instance can be assembled in 24 to 48 hours depending on their size, making them one of the most efficient solutions for events that have to be organised in very short time frames. Entrances and exits need to be positioned considering foot traffic flow in the area. As always, the renter or temporary structure supplier must be fully aware and compliant with all safety regulations for public structures, putting in place contingency measures in case of the need for emergency evacuation. Also, access for the disabled, including wheelchair ramps, wide doorways, walkways should be integrated into the design. Top quality materials taking into consideration highest standards of quality and safety, including flame retardant materials. A temporary structure begins as a skeleton that is transformed into a space for work or entertainment. It is a framework to be transformed into a stage so it needs high quality lighting design, upholstery, draping, furniture and accessories. Different types of facilities and amenities such as restrooms, catering facilities, internet connectivity, business services etc. have to be factored into both design and budget. Event agencies should have the knowledge and experience to advise clients about what will be required and the ability to avail the necessary. The highly experienced event contractor can provide the event management agencies with ideal solutions for integrating function rooms and spaces to different events. Reputable event contractors will be able to provide detailed transparent breakdowns for each element as well as different options to suit different client requests and desires. 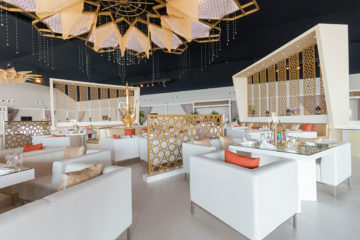 As one of the leading providers of tent and marquee rental solutions in Dubai and all over the Middle East, we provide a large range of unique shapes, sizes and textures. We also offer a décor and furniture rental service with off-the-shelf and customised options. We offer the following styles and can help clients in selecting the most suitable size and shape to suit different events. 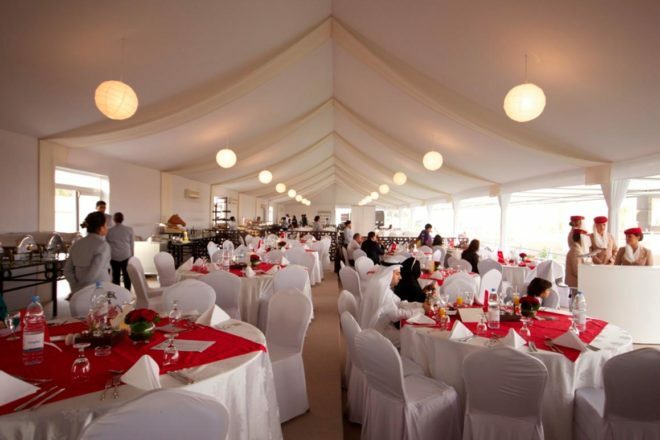 Two-sloped structures are classic and timeless tents adaptable to host all kinds of events, from private parties, receptions, weddings, conferences and exhibitions. Marquees are evergreen sophisticated options for optimal elegance and sophistication. Arcum temporary structures feature a curved ceiling opposed to a sharp angle for a softer take on the traditional two-sloped tents. The double deck is a multifunctional steelwork structure. Suitable for large events and exhibitions. 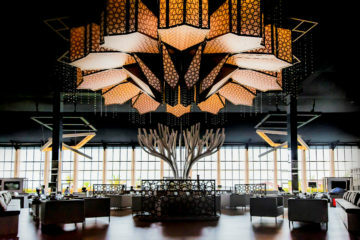 An efficient, skilled reliable partner can deliver a stylish temporary structure that not only meets all the physical and technical requirements for interior volume and safety but all the aesthetic needs for a special and refined atmosphere that increases guest engagement and lingers in the memory. Our team of experienced professionals works closely with clients to move the project from concept to execution, providing more than just an event rental option to a comprehensive venue solution that is stress-free and seamless. Safety is our priority: whether the structure is custom-made or from our stock of tents and marquees, our engineers run static calculations and produce Method statement and risk assessments documents. Some of our recent projects reveal some of the marvelous effects that can be achieved by using temporary structures. 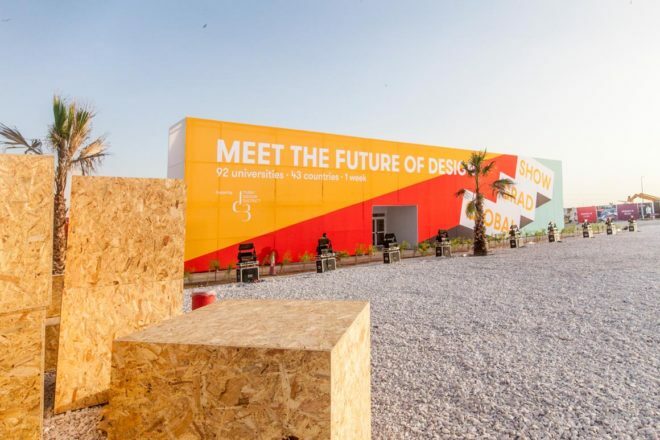 Working with DesignLab Experience over the course of an entire month, our team constructed an elaborate 2,500 square meter and 15-metre-high structure, entirely made to measure. 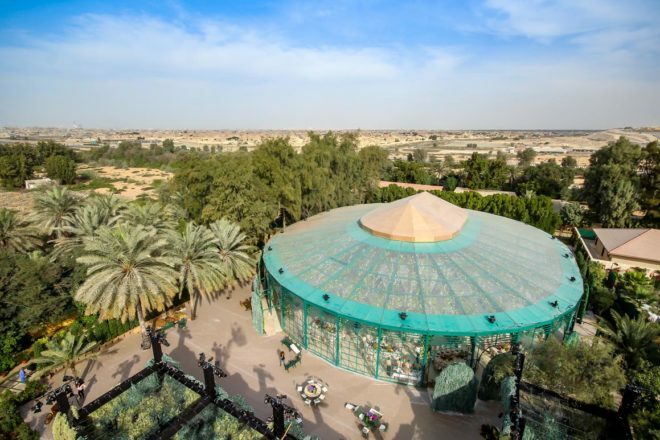 Located in the middle of open green spacer stables, transparent panels allowed guests to freely view the luxuriant exterior. Sheer linen drapes were used to set off a sophisticated inner space, enhanced by a magnificent branchelier ceiling installation. 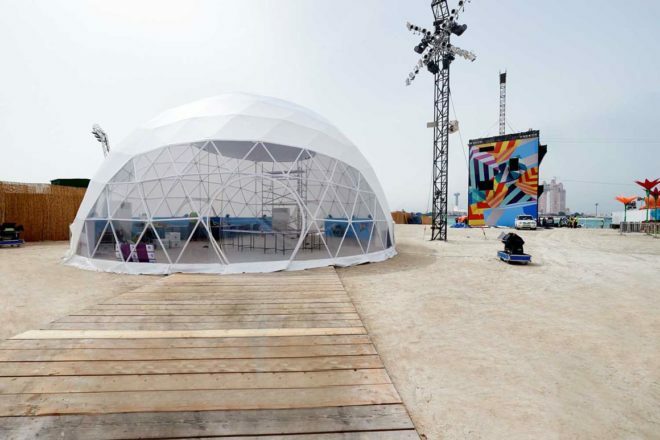 As part of the special annual community event commemorating HH Sheikha Fatima Bint Mubarak, and her contributions to UAE society, we have set up our newest dome tent, a space age white geodesic shape with clear panels on one side, while providing adequate shading. Our team consisting of 75 people worked together to bring to life a magnificent and unique structure in Kuwait. 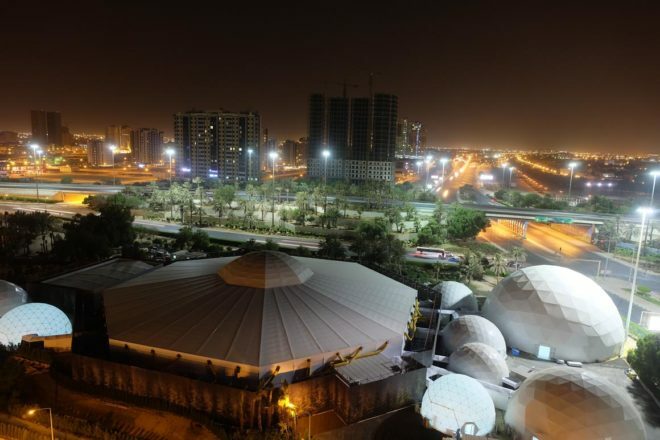 A large central structure is surrounded by 8 domes of different sizes connected by a network of walkways. Framed by the wide Kuwaiti skis, the installation evokes Arabic tradition but is utterly modern. 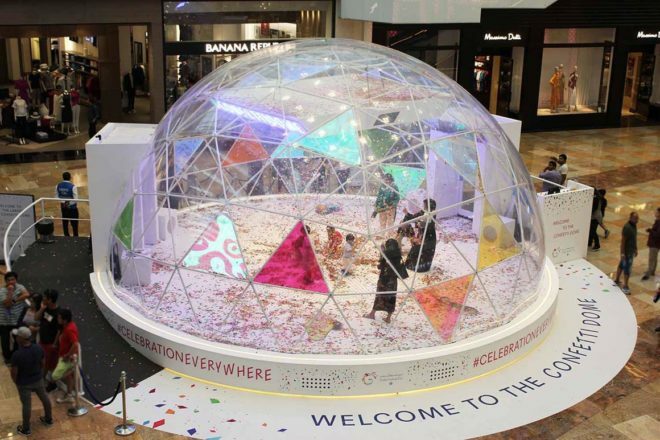 As part of Dubai’s exciting summer activities, we have set up one of the largest Confetti dome ever seen at DFC. Kids went wild at the chance to prizes including cinema tickets awarded to the best selfies taken inside the dome. 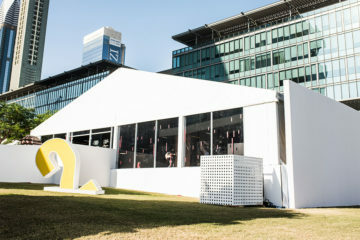 For anyone wanting to create an unforgettable event, an all-encompassing customer experience or that special ambience for an exclusive private event or high-profile public occasion, temporary structures should be at the top of the possible venue list, simply because of the range of creative options they afford. 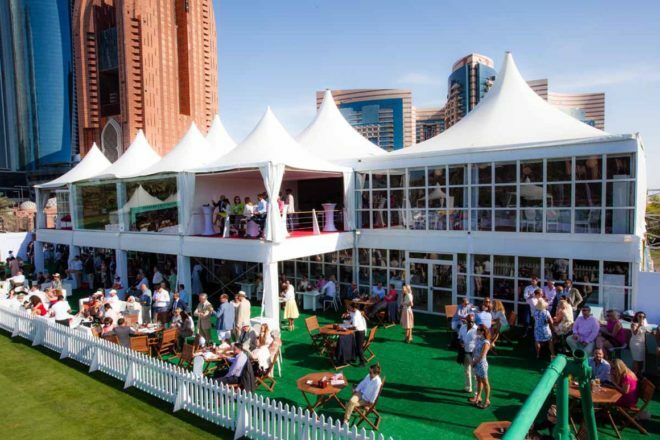 Temporary structures, whether tents, marquees or domes can transform any space, showcase any brand and thrill any sponsor. More than simple event equipment rental and installation, our dedicated experts can help at every stage from project implementation to execution, providing invaluable guidance and advice in selecting the best temporary structures to suit all budgets.